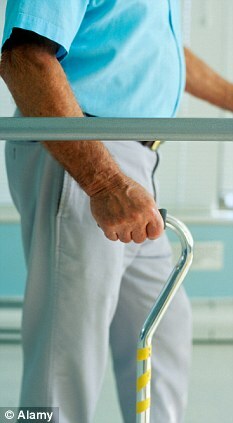 The ‘grow your own’ hip replacements that make new bone then degrade away | Mail Online. New hope: A ‘grow your own’ hip replacement could be introduced within a decade. Scientists at the universities of Edinburgh and Southampton have joined forces to explore the possibility of ‘grown your own’ hip replacements. There are about 300,000 fragility structures in the UK every year, while it is reported around 14,000 people die due to fractures of the hip. Along with the risk of blood poisoning from metal-on-metal replacements, the new research could prove to be a god-send for millions of people. The idea is that an implant made from plastic material would help stimulate new bone to grow, and once the structure is strong enough, the implant would degrade away. Stem cells attach themselves to the ‘scaffold’ and instead of turning into blood cells they turn into bone cells. Speaking to the Daily Telegraph, Professor Mark Bradley, a chemist at Edinburgh University, said: ‘Certain things wear out before others, hips for example. ‘The idea is that you would shape a replacement hip to what was wanted, put it in position and wait. The plan is for the operation to be available within a decade, and at the moment the research is still being tested on animals, although it has been tested on human tissue in lab tests.